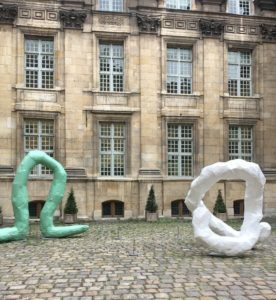 If you are in Paris don’t miss the exhibition of the Austrian sculptor Franz West (1947-2012). West was more than a sculptor he was a real philosophical performance artist and he inspired much of the artistic talents of the 1970s. The Centre Pompidou presents the biggest retrospective of Franz West including almost 200 artworks e.g. : drawings from the early 1970s, its first sculptures, the series of “Passstücke”, the famous “Chaiselongue” as same as other performative sculptures made to engage with the visitors to “reveal their neuroses”. The exhibition also includes a selection of the “papier mâché” sculptures and it features West Lemurenköpfe (Lemur Heads).